On Monday 17 December, Alison Tipler, Hire Manager for Northampton contract hire and fleet management company Specialist Fleet Services Ltd (SFS), will be presenting gifts to Year 1 & Year 2 children at Duston Eldean Primary School to thank them for their Christmas Card designs. 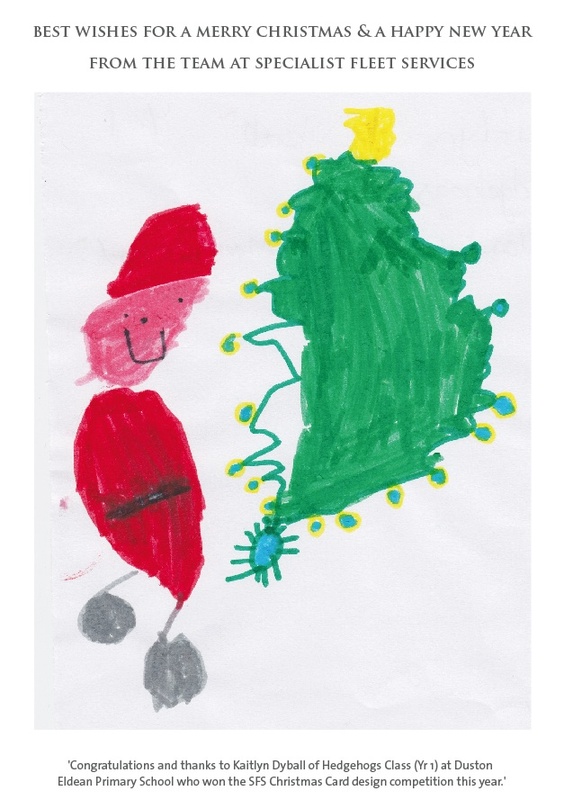 The winning design, which SFS has sent out to its customers and contacts via email, was drawn by 6 year old Kaitlyn Dyball of Hedgehogs Class (Yr 1). Kaitlyn will receive a £20 WHSmith voucher at a special school assembly. The runners up will also be presented with £5 voucher each. Specialist Fleet Services Ltd (SFS) has strong links with the school having trained some of its staff to help the children with their reading. As part of Business In The Community’s Right to Read initiative SFS volunteers visit the school on a regular basis to read with children for 1.5 hour sessions at a time.